Welder essential variables explored and explained. Welder essential variables are specified within the welding codes. (Click here to read more about welding codes.) The welding codes specify the types of tests that Welders need to do to become "qualified Welders". (Click here to read more about typical Welder coding tests.) Once the Welder has been successfully coded, the question arises as to what the qualification actually covers. This question is answered within the codes by listing welder qualification essential variables and the associated qualification ranges. For each code these welder essential variables will be slightly different, and the qualified ranges will be different. It is not the intention of this web page to go into a full interpretation of all the different codes and their essential variables and qualified ranges. To get that information, you will need to look at the relevant welding code. The intention of this web page is to list the typical Welder qualification essential variables, and to discuss why they are listed in the welding codes. Where there are designations associated with the different welder essential variables, we will list the typical American and European designations. The European designations, when applicable, are listed second. Oxyfuel Gas Welding (OFW / 311): This is the "old fashioned" flame welding using a "blow torch". Shielded Metal Arc Welding (SMAW / 111): Also called Manual Metal Arc Welding (MMAW) or stick welding. Submerged Arc Welding (SAW / 121[Solid Wire] & 125[Tubular Wire]): In this welding process the welding arc is "submerged" below a covering of flux powder. Gas Metal Arc Welding (GMAW / 131[MIG] & 135[MAG]): Also called Metal Inert Gas (MIG) or Metal Active Gas (MAG) welding. This obviously depends on whether an inert or active gas is being used for the shielding. Flux Cored Arc Welding (FCAW / 114[Self Shielded] & 136[Gas Shielded]): In some codes FCAW and GMAW are considered the same process, with the type of wire being an additional essential variable that distinguishes them apart. Gas Tungsten Arc Welding (GTAW / 141[Solid Wire] & 142[No Wire] & 143[With flux cored wire] & 145[Using reducing gas]): Also called Tungsten Inert Gas (TIG) welding. Plasma Arc Welding (PAW / 15): PAW looks similar to the GTAW welding, but there is an additional plasma gas that is introduced. The melting of the metal is primarily achieved by the plasma gas rather than directly by the arc. Please note that the numbered designations above are the European designations. Machine and automatic welding processes such as Electron Beam Welding (EBW) or LASER Beam Welding (LBW) and the like are not listed here, as these are dealt with in a different way to the skill based welding processes. As a general rule, each process will only qualify you to weld with the process you used in the coupon. It is very possible to use more than one process in each coupon. Two processes per coupon is quite common. (e.g. GTAW root and SMAW filler and cap.) Now and again 3 processes are used, to get the most “bang for your buck” out of the qualification process. (e.g. GTAW root, SMAW filler and FCAW filler and cap.) Practically it would be very rare to weld a Welder qualification coupon with more than 3 processes. Backing is when the weld is deposited against something that can contain the welding arc and weld pool in the root of the joint. When a joint is welded from one side only, and the weld needs to be full penetration without backing, then it takes a lot more skill than if the joint can be welded from both sides. Welding with or without backing is therefore an important Welder essential variable. As a general rule, if the Welder qualification was welded without backing, then you will be qualified to weld with or without backing, but not visa-versa. When performing multi pass welds, a welder that lacks skill will end up with very uneven weld layers. As the thickness increases, this can lead to a very unsightly weld that leads to areas where slag can easily be trapped, and an uneven cap. If a Welder can show that s/he has the skill to weld above a certain thickness, then further increases in thickness will not be giving much additional information from a skill perspective. For this reason, there tends to be a maximum thickness of deposited weld metal given in the codes above which all thicknesses are qualified. For ASME IX this is 13mm. For deposited thicknesses below 13mm, the Welder is generally qualified to weld up to 2 times the deposited thickness within the coupon. When welding a coupon with more than one welding process, the deposited thickness for each process is taken separately. For particularly thin materials, the Welder may need to show that s/he is capable of welding such a thin material. Many codes that assume you are only going to be welding relatively thick materials (e.g. ASME IX) do not specify a minimum thickness to which the welder is qualified. Another complication to take note of, is that if you are using the short circuiting mode of transfer (see lower down this page for transfer mode explanation) for the GMAW process, then the qualified thickness is further limited. 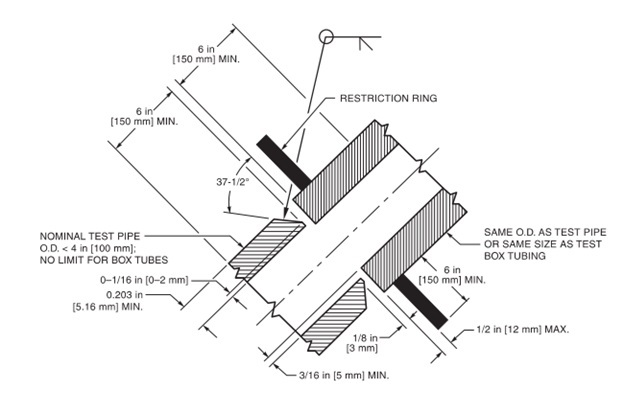 As a pipe's diameter decreases, it becomes more difficult to weld. The welder will therefore need to display that s/he can weld down to the smallest diameter that needs to be welded on the production work. Many codes tend to specify a number of diameter ranges, to make this welder essential variable easier to implement and control. Above a certain diameter, (different codes have different ideas about what that diameter is) the difficulty will not really change much, hence the approach is that even if the coupon welded was larger in diameter (or even a plate) then the Welder can weld down to that specified diameter. Less than 25mm qualifies from the diameter welded and larger. 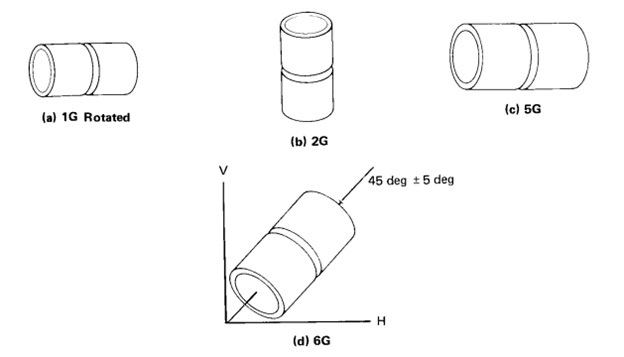 25mm to 73mm qualifies from 25mm diameter and larger. Over 73mm qualifies from 73mm diameter and larger. Please note that other codes have different ranges, but I think you get the general idea. From the examples listed above, we can see that the ISO designations have started to largely mirror the ASME system, with some variations. Also note that the qualified ranges are often wider than just the single group within which the coupon was welded. As an example, within the ASME IX code, a welder qualified on a P1 material is qualified to weld all materials P1 to P15F, P34 and P41 to P49. This is a very wide array of base materials qualified. (Carbon steels, low alloy steels, stainless steels, Copper Nickel and Nickel based alloys.) It may seem that one test piece can allow the welder to weld almost anything, but the "problem" is that this should be seen within the context of the filler metal welder essential variable, because the different materials will need different filler metals to weld. The EN 287-1 code does not give such wide ranges, but in essence once the filler metal variable is brought into the picture there is not such a big difference between the two systems. In the structural steel welding codes, welding on one of the base materials listed in the code typically allows the Welder to weld on all the other materials listed in the code. This approach is possible because the scopes of the structural codes in terms of materials are very limited. Welding processes that use flux can have significantly different flux types. For instance, SMAW electrodes for welding steels can have flux coverings that result in a very hard "digging" arc with fast freezing flux, (e.g. E6010) or a mild arc with fast freezing flux (e.g. E6013) or a low hydrogen flux, (e.g. E7018) or a flux that contains a lot of iron powder. (e.g. E7024) Each of these different fluxes requires the welder to master different skills to weld successfully. The type of alloy of the filler metal can also have a significant effect. As an example, materials with high Nickel contents tend to be more viscous wen being welded, so they are much less fluid and do not flow well. The Welder needs to move the arc to actually push the weld metal in the right direction. The Welder cannot rely on the surface tension to move the molten weld metal like when welding steel. So, each material does have its own issues. Based on the interaction of the two factors listed above, the codes classify filler materials into groups based on their weldability from a skill perspective. Within the ASME codes, filler materials are grouped as "F" numbers. EN 287-1 groups the filler metals based on the type of flux covering, or for wires without flux coverings, the classification is based on whether the wire is solid, metal cored or flux cored. The welding code will then give qualified ranges for the filler materials qualified. Generally the code will make a call on which filler materials are more difficult to weld with, and then allow the Welder to also weld filler materials that requires a lower skill level. Welding position is one of the main welder essential variables used by all the codes. It is obviously much more difficult to deposit a weld which is in the vertical position than a weld that is in the flat position. In the case of the vertically oriented weld, the liquid weld pool will want to follow gravity and make its way to the floor. The weld pool for the weld in the flat position will just be drawn into the weld preparation by gravity, so will be much easier for the Welder to control. 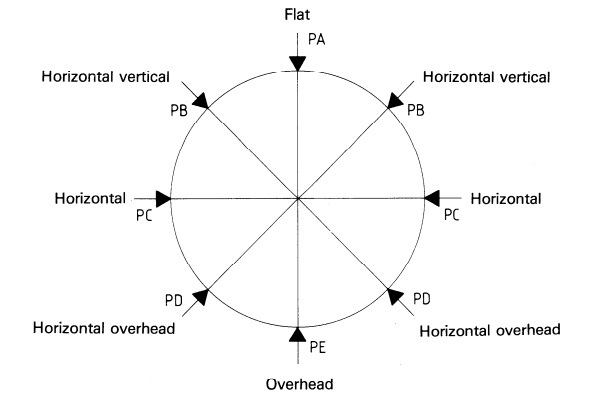 Most codes have similar requirements for weld positioning and the subsequently qualified ranges. Different codes do however use somewhat different designations for the different weld positions. ASME IX differentiates between production positions and test positions. There is more to the European designations for position than shown in the sketch above, but I don't think that more detail will add too much value and is therefore not warranted here. The qualified ranges for EN 287-1 is quite similar to that in the ASME IX code. Besides just the normal test positions shown above, some codes also introduce restrictions as part of their test positions. This is typical for codes dealing with boilers (Where spaces between boiler tubes can be very small.) and also structural codes. (Where tubulars intersecting at tight angles can restrict the Welder's access to the root of the joint.) Often an "R" designator is placed behind the test position to indicate that it has been welded in the restricted position. See the sketch below for a typical AWS D1.1 test joint for a 6GR test. Another aspect associated with the position of the test coupon is the direction of the welding. Normally this is termed the "progression" of the welding. The two possibilities being either an uphill progression or a downhill progression. Most of the time Welders will need to weld in the uphill progression. As an example, if the Welder needs to weld a pipe girth weld with the pipe's axis in the horizontal direction, (5G test position) and starts welding from the bottom of the pipe and progresses upwards to the top of the pipe, it will be called an uphill progression. 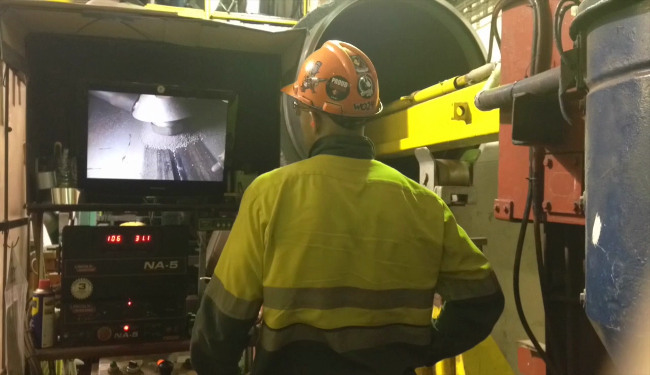 The most common circumstance for doing downhill progression is when performing high productivity welding on pipelines. Here the Welder typically starts welding on the top of the pipe and progresses downward to the bottom of the pipe. This is often called "stovepipe welding". The main reason for welding in the downhill progression is that it leads to much faster travel speeds and more productive welding. Most codes will only allow you to perform production welding in the welding progression you used in the Welder qualification test coupon. For welding processes such as GTAW and GMAW, you will need to provide a gas on the back side of the weld when performing a single sided weld in alloys that easily oxidize when hot. This situation is typical for welding stainless steels, nickel based alloys and titanium alloys amongst others. The shielding gas provided on the back side of the weld is called a backing gas. Most of the codes will require that if you welded the Welder qualification coupon using a backing gas, then you are only qualified to weld with a backing gas. If you welded without a backing gas then your qualification range will be: With backing gas and Without backing gas. Short circuiting mode: Also called dip transfer. Here the wire dips into weld pool and causes a short circuit, extinguishing the arc momentarily. Resistive heating in the wire then causes the wire to melt back and the arc is re-established. As a general rule this occurs at voltages below 19V or so. The disadvantage of this transfer mode is that most of the heat goes into the wire, so it can easily lead to lack of fusion defects. The big advantage is that it is a low energy mode, so it is easier to control, especially when welding thin materials or when welding out of position. Globular transfer mode: When the voltage is increased, the weld metal is transferred in globules. This mode can be a bit messy, as the amount of spatter increases significantly. It is also possible to weld out of position with this mode of transfer. Spray transfer: Spray transfer is only possible if the inert gas content of the shielding gas is high enough. The general rule is that the Argon (Ar) and Helium (He) contents should be above 85%. Once the voltage reaches around 28 to 30V, then the weld metal transfers across the arc in a stream of particles. This is a high energy mode of transfer and most materials cannot be welded out of position with spray transfer. The notable exception being aluminium. Pulsed Spray: When the power source is set such that the voltage is constantly fluctuating between the parameters associated with dip transfer and spray transfer, then pulsed spray is experienced. The big advantage of pulsed spray is that it mostly eliminates the lack of fusion problem of dip transfer while allowing out of position welding. Strictly speaking there is also a high energy axial spray transfer mode, but this is not usual for manual welding, so is not dealt with here. As a general rule, the codes lump globular, spray and pulsed spray together while keeping dip transfer separate. This is in recognition of the additional skills needed to perform dip transfer welding without getting the lack of fusion defects. So, the qualified ranges are typically that dip transfer qualifies you only for dip transfer, and welding with one of the other modes qualifies the Welder to weld any of those other modes of transfer. A note regarding the transfer modes of Flux Cored Arc Welding (FCAW) is probably in order here. There is much written about different transfer modes for FCAW, but my personal experience is that there is really not much in it. Personally as far as I am concerned, FCAW always delivers a globular mode of transfer. I am sure that there will be those that disagree with me on this point. Some welding processes do not use a consumable electrode. This means that they allow you to weld without adding any filler metal. This is called autogenous welding. GTAW and PAW are examples of such welding processes. When welding the coupon without filler you will generally only be qualified to weld autogenously. Conversely, to perform autogenous production welds, you will need to weld a coupon without filler. Apart from fusing the two parts of the joint without adding any filler, welding processes that allow autogenous welding also allow you to use separate pieces of metal that are placed in the joint and then fused. Typically these would be in the form of a ring of metal placed in the root of a pipe but joint, and then melted along with the ends of each pipe to complete the weld root. These additional “pieces of metal” are called inserts. The main reason for using inserts is that it makes welding a single sided root in a pipe easier. It does however take some know-how to do this, so there is a specific skill involved. As a general rule, when you welded the coupon with an insert, then you will only be qualified to weld with an insert. Conversely, you will not be qualified to weld with an insert without doing a qualification coupon using one. While many cheap home welding power sources only deliver AC, in serious welding AC is seldom used. There are some exceptions, with the notable exception being the use of AC in GTAW welding of aluminium alloys. By changing the polarity of DC between electrode negative or electrode positive, the ratio of energy going into the electrode verses the base material can be changed. Welding with different current and polarity types require somewhat different skills for some of the welding processes, (e.g. GTAW) hence the introduction of this essential variable for Welders. We have just looked at the most common Welder essential variables listed in the welding codes. Some codes will have some additional essential variables. Each code also deals with the essential variables in slightly different ways, but the summary of essential variables given above is a good basis for understanding why codes have the qualified ranges that they do.